Goniometry is the measurement of joint angles. The tool you will use to measure joints is a goniometer. There are many different types of goniometers on the market, but each has essentially the same structure: two arms (one stationary and one moveable) and an axis (fulcrum) that is surrounded by the body of the goniometer, which contains a measuring scale. Examine posture with the patient in a static position and in as few clothes as possible to allow an unobstructed view of all postural elements. (See the posture examination checklist later in this chapter.) Correct posture minimizes stress on muscles, bones, and joints while incorrect posture places abnormal stress on these structures. The majority of active people experience leg and foot problems sometime in their lives. Tremendous forces, both compressive and rotational, are transmitted through the weight-bearing structures of the foot, ankle, and leg. Consequently, both traumatic and chronic injuries frequent this region. Unique to this region of the body is the examination of the sensory organs for sight, smell, and hearing. This includes a close inspection of eye and ear structures using an ophthalmoscope and otoscope, respectively, and testing for visual, smell, and hearing acuity. 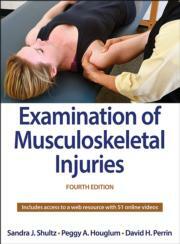 Examination of Musculoskeletal Injuries, Fourth Edition With Web Resource, guides current and future athletic trainers and rehabilitation professionals through the examination and evaluation of musculoskeletal injuries both on and off the field.